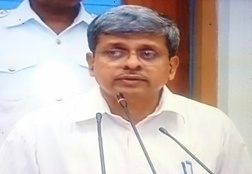 Skill Development trainings programmes should focus on qualitative training and engagement with quality employers for the youths ‘skilled in Odisha’ directed Chief Secretary Sri Aditya Prasad Padhi. Sri Padhi gave these directions while reviewing the progress in ‘adoption of common norms in skill training programmes’ of all departments in a high level meeting held in Secretariat conference hall today wherein Principal Secretary Skill Development & Technical Education (SD &TE) Sri Laxmi Narayan Gupta outlined the issues for discussion. Director State Employment Mission Sri G. Rajesh presented the updates. Chief Secretary directed the departments not to take up short duration computer courses like tally, data entry, DTP etc which do not add to the employability or entrepreneurship. The departments were asked to focus on high employable trades in construction, food processing, manufacturing, hospitality, healthcare sectors. The departments were asked for grading of the Project Implementing Agencies (PIAs) and training centers to identify good training partners. The non-performing and sub-standard agencies should not be entrusted with more skill programmes. Chief Secretary directed all depts. to share the list of such sub-standard PIAs with each other for precautionary actions. It was decided in the meeting that common mobilization and motivational programmes will be organized at village, Panchayat and ULB level to recruit more youths to the training programmes. The youths would be given the option to choose the trade, department and PIA as per their choice. It may be pertinent here to mention that Chief Secretary had earlier directed various departments to adopt common norms and rework their skill training programmes within 15 days. Accordingly, the departments presented their updated programmes in today’s meeting. Principal Secretary SD &amp; TE Sri Gupta appraised that more cost has been provisioned for providing quality training, good food &amp; hygienic living with basic minimum facilities at residential training centers. Around 36% of cost hike has been done to achieve higher quality in these components of the training programmes. Chief Secretary directed the departments to check up the quality of food and training at the field level and ensure that money provided for the purpose is utilized appropriately. Available data show, State had targeted to impart training to 11 lakh youths under Chief Ministers Employment Generation programme ( CMEGP) within 5 years from 2014-15. In the meanwhile 3.47 lakh youths have been trained in various employable and self employment skills during 2014-15 &amp; 2015-16. Different departments have worked out their training programmes keeping in target to train around 8 lakh youths in coming 3 years. The departments like Panhyati Raj, SD&amp; TE, H &amp; UD, ST &amp; SC Dev, Agriculture, Handloom &Textiles, Commerce &amp; Transport, Tourism, MS&amp;ME and IT have set the target of skilling around 2,44 000 youth during 2016-17. Sri Subroto Bagchi, Chairman, Odisha Skill Development Authority, specially invited to the meeting advised to harbor on those skills which have higher demand in world market. Sri Bagchi also advised to develop centers of excellence in skill training in each urban center with chosen trades. He further advised that the district and State level officers should regularly visits the training centers and look into the activities going on there. Development Commissioner Sri R. Balakrishnan, Principal Secretary Commerce &amp; Transport Sri Sanjay Rastogi, Principal Secretary MS&amp;ME Sri Gagan Kumar Dhal, Secretary Panchyati Raj Sri Deo Ranjan Kumar Singh, Secretary Housing &amp; Urban Development Sri G. Mathivathanan, Secretary Textiles &amp; Handloom Smt Chitra Arumungam, Director Employment Mission Sri G. Rajesh, Special Secretary IT Sri Rudra Narayan Pallai along with other senior officers participated in discussions.